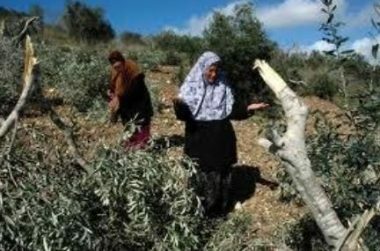 Israeli forces, today, uprooted some 350 olive saplings and razed lands in Khillet al-Dabe’, Masafer Yatta, in the Hebron area of the southern occupied West Bank, according to Rateb Jabour, coordinator of the National and Popular Committee in southern Hebron. Jabour told WAFA that Israeli bulldozers razed lands and uprooted saplings planted by local residents and anti-settlement activists in the area, in order to reclaim the land and protect it from Israeli takeover. Masafer Yatta residents were expelled at the time of the establishment of a firing zone, in the 1970s, and were eventually allowed back, following a long court battle, but are under the constant threat of being expelled or seeing their homes demolished.